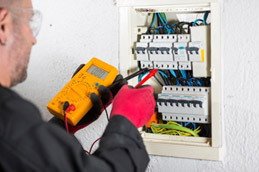 When selling or renting a home in Western Australia you are required to have fitted a minimum of two working RCD’s (Residual Current Devices) also known as Safety Switches, these should be connected in series with all lighting and power circuits in your home. Devices with fixed wiring like air conditioners and cooking equipment are not required to have them fitted retrospectively, but we recommend you do so. Retrofitting RCD’s in your switchboard can be relatively easy and cause little disruption, however we often discover poor wiring, and asbestos within older switchboards, so this can cause some delays. Usually these older switchboards have rewireable fuses instead of the modern safer circuit breakers and RCDs, along with asbestos Zelemite backing plate to which they are mounted, we recommend to retrofit a new modern switchboard in place of these now unsafe relic’s of the past. RCD’s should be tested regularly – press the test button every three to six months to test the correct operation of your RCD’s, if they wont reset give PRF Electrical a call and we will promptly attend to the fault. Smoke alarms fitted to mains power are also required, there should be a minimum of one fitted, but we quite often install two or more throughout larger homes. The objective is to have alarms installed in or near sleeping areas. Also a new requirement is to have all detectors interconnected, so if one should trigger an alarm then they will all alarm, waking the household to smoke. A debate recently about Ionisation verses Photoelectric smoke detectors was aired on TV, we are not averse to which type you want fitted in your home. Ionisation detectors react better to detecting fast-flaming fires that don’t emit much visible smoke-heat and larger particles of smoke, whereas Photoelectric detect finer particles of smoke and are best at detecting smoky and smouldering fires these should be cleaned more often to prevent false triggering. 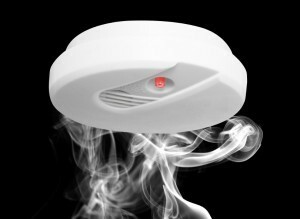 Don’t forget the 1st April every year is your smoke alarms birthday – give it a new battery and a wipe over to remove dust.